Walk south along the road to the cable car station for the Stock. Do not be tempted! The path goes up steeply right of the CC station and has two sets of zig-zags, separated by an enchanting wooded glade. Eventually, the path levels (there is no more hard work up) & swings to the left of the Stock, giving a glorious view down the Gasterntal. There are labelled specimen plants to the right of the path. 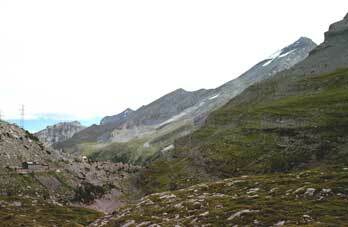 (Just past this, the 'struggle' path from the Gasterntal joins from the left). 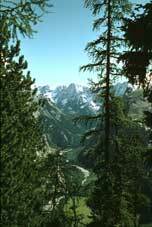 The path goes on through the Sunnbühl meadows & heads gently up to the Schwarenbach Hotel for coffee etc. After the hotel & looking back, you see the view in the two right-hand photos below, demonstrating the effect of global warming in 24 years. Hotel Schwarenbach, left & Altels 1998. 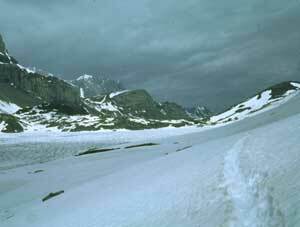 The path contours round a cwm, then winds up to the Daubensee, with the pass now visible ahead. The path goes to the left (East) of the lake & up to the pass, where there is a sudden, dramatic view across to the Pennine Alps. (Café by the cable car station). You now have a choice - either to go down to Leukerbad or to head West into the Lammerenboden to the Lammern Hut, to climb (rope & ice-axe needed) the Wildstrubel alpine option, the next stage on my tour to Fafleralp but see below if you don't fancy it. Leukerbad. Yes, you can walk it. The path down to Leukerbad is a brilliantly constructed 18th Century pack-horse track, perfectly safe but cut down the vertical cliff to Leukerbad. 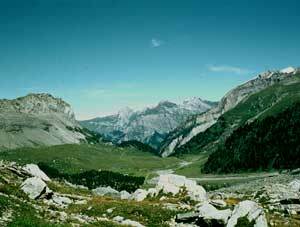 This is possibly the most dramatic place that ordinary walkers can safely find themselves in the Alps. 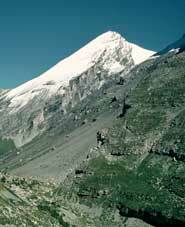 If you are just crossing the pass or want to go on to Fafleralp (this tour) but are not an Alpinist, go down the Gemmi footpath on this link to Leukerbad & pick up the tour from there. 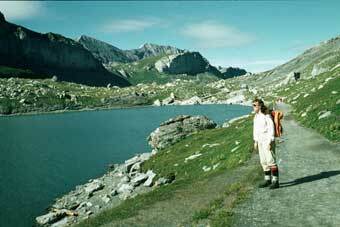 Otherwise, go to the Lammeren Hut for the Wildstrubel alpine option by turning right (West) before the top of the pass on a marked footpath & see the next page. 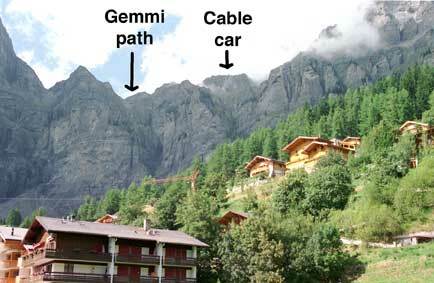 To go up the pass from Leukerbad, follow the road that runs round the back of the village to the cable car & walk up (resisting temptations again, tho' I have done both) to the left of it. Part is marked in on the photo to the right but see this page. Where it disappears into the gorge, it zig-zags up a few times to the top. 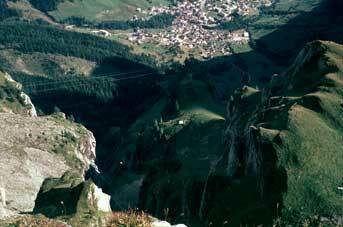 Turn right for Kandersteg & left for the Lammerenboden.